The first mosaic appeared in Ancient Babylon before our era. Samples it has been preserved almost intact – a fine opportunity to admire the skill of ancient craftsmen. Today mosaic tiles are used practically everywhere, but for a proper and beautiful styling will take some skill. - a wooden block or hammer. Pre-prepare the surface on which you will lay tile. It should be smooth and dry. Allowable temperature for laying tiles from +5°C to +30°C. Now with a spatula smeared movements apply the glue to the surface, for example, on the wall. Keep in mind, you need to cover only the section of the wall that you will have time to process for 10-15 minutes. Apply glue to the back side of the tile - it is convenient to use a flat end spatula. The double-glue suitable for all types of tiles, but for transparent and translucent it is required. Otherwise, through the tile will show through the glue strip. Double coating will improve the adhesion between the tile and the surface. Now apply the glue on the tile paper side out. Don't wait, the solution dries and the tiles loosely attached to the wall or other surface. If necessary, trim the tiles. Then gently tap on it with a wooden block or hammer to even out the surface and to achieve full attachment. Prostuchite and the connection of the individual mosaic sheets to make smooth the entire area of the veneer and prevent the formation of air bubbles between the tile and mortar. 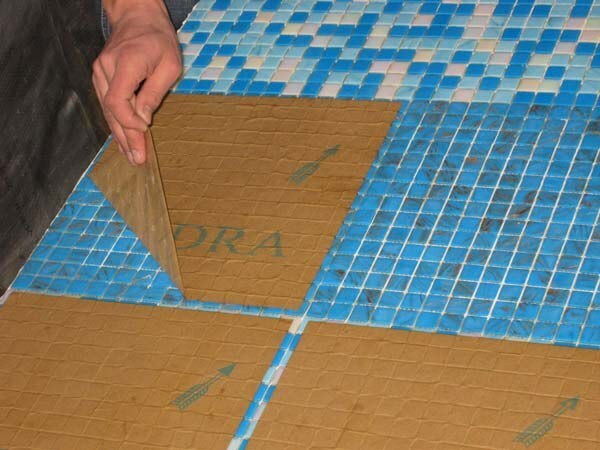 Each tile sheet should be laid out so that grout joints is smooth and uniform in size. After 20 minutes, careful not to move the tile from the place, wipe it with a damp sponge. When the paper coating will darken, i.e., soaked with water, remove it by pulling the corner down diagonally. If the paper is difficult, again moisten it with a sponge. After waiting a couple of minutes, remove all paper from the attached part of the tile. Then immediately tweak the seams – they must be on the same level. 24-48 hours proceed to apply grout. Clear the tiles from glue and paper residue with a brush and damp sponge. Excess glue carefully remove universal knife. Hard trowel, spread the grout on the tile surface at an angle of 45°. Wait 20 minutes and start removing excess grout. Wipe the mosaic with a dry cloth, then wipe it with a damp sponge and wipe again with a dry cloth. Give clean the tile to dry and after 15 minutes, Polish it to a Shine with a soft cloth. Do not pull with polished or plaque with tiles will be very difficult to remove. To hide the excess glue that may protrude above the surface of the tile, match the grout and primer appropriate to the tile color. Choosing an adhesive, consider the conditions surrounding the tile environment: extremes of temperature and humidity. The adhesive should fit perfectly to the surface on which you lay the tile. If you put glass tile, choose a latex adhesive.